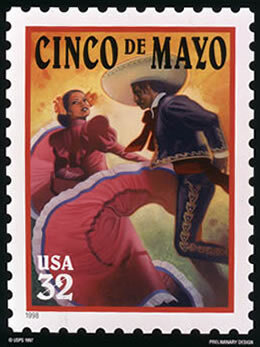 Saturday is the 5th of May and Cinco De Mayo is celebrated by many Spanish speaking countries. I wasn’t exposed to this celebration until I was older and met some Spanish speaking friends. From an outsiders perspective Cinco De Mayo is a just like St. Patricks day with a little more flair. I thought I would do a little research to find out the history behind Cinco De Mayo. On May 5 1862 the Mexican people held off the French army in the battle of Puebla and since then May 5th has been celebrated. The French army of 6000 men had agreed to withdraw to the coast, but left some of the sick soldiers behind. The Mexican people saw this as a breech of the agreement and talks to withdraw broke down. The Mexicans retreated to Puebla which was heavily fortified. The French attacked Puebla, but by the end of the day had run out of ammunition leaving the attacking forces unsupported. In the end the Mexican people had run the French army off having only 83 casualties to France’s 462. Eventually more French troops were sent to Mexico and overtook Puebla, but the legendary battle of the Mexican people defeating the French was held as a celebration and continues every 5th of May. I hope everyone enjoys their Cinco De Mayo with friends and family.